[N.p., London, 1861. Facsimile printing of the original autograph letter. Two pages, printed in blue-black ink on laid paper. 1 vols. Oblong 4to. Old fold. 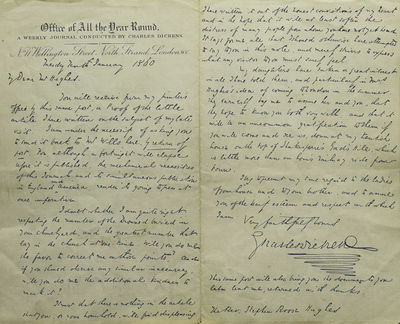 Facsimile printing of the original autograph letter. Two pages, printed in blue-black ink on laid paper. 1 vols. Oblong 4to. Uncommon printed facsimile of this notable letter from Charles Dickens, writing as the editor of All the Year Round, to Rev. Hughes of St Gallgo's Church, whose heroic efforts at the time of the wreck of the Royal Charter off the coast of Anglesey in August 1859 inspired Dickens to write the "little article" mentioned here, published in All the Year Round for 28 January and subsequently adapted as the first chapter of The Uncommercial Traveller. The invitation extended by Dickens to the minister and his family is poignant, as the strain of the exertions contributed to Hughes' untimely death on 4 February 1862. In the British Academy/Pilgrim Edition of Dickens' letters, the original letter is recorded as in the collection of Mrs. A.K. Frazer; it is further noted that "facsimiles of this letter were sold by Hughes, to provide a monument (now in Llanallgo Church) to those drowned in the Royal Charter." This allows a narrow dating to 1860 or 1861. No copies of this facsimile are recorded in the Gimbel collection, in other major Dickens holdings, or in OCLC. My Dear Mr Hughes, You will receive from my printer's office by this same post, a Proof of the little article I have written on the subject of my late visit. I am under the necessity of asking you to send it back to W. Wills here, by return of post. For although a fortnight will elapse before it is published, the mechanical necessities of this Journal and its simultaneous publication in England and America, render its going to press at once imperative.